Joget Workflow is an open source platform that allows you to build enterprise web applications easily, due to its rich set of tools. It is also a rapid application development platform that provides complete agile development capabilities, including consisting of processes, forms, lists, CRUD and UI; not just back-end EAI/orchestration/integration or the task-based interface. Due to the Joget plugin architecture, developers can easily extend the platform and integrate it with other systems. Let’s see how to get highly available Joget cluster in the cloud in a few minutes for further using. 1. Go to our site and sign up or log in with your Jelastic credentials. 2. Click Create environment to set up your environment in Jelastic. 3. Pick your application server (Tomcat 6 or 7), select the database you want to use (MySQL in our case). Then specify the number of cloudlets for each node and switch on HA to provide high reliability, scalability and perfect fail-over capabilities for your environment. After that type your environment name, for example, joget-cluster, and click Create. In a minute your highly available environment will be created. 1. 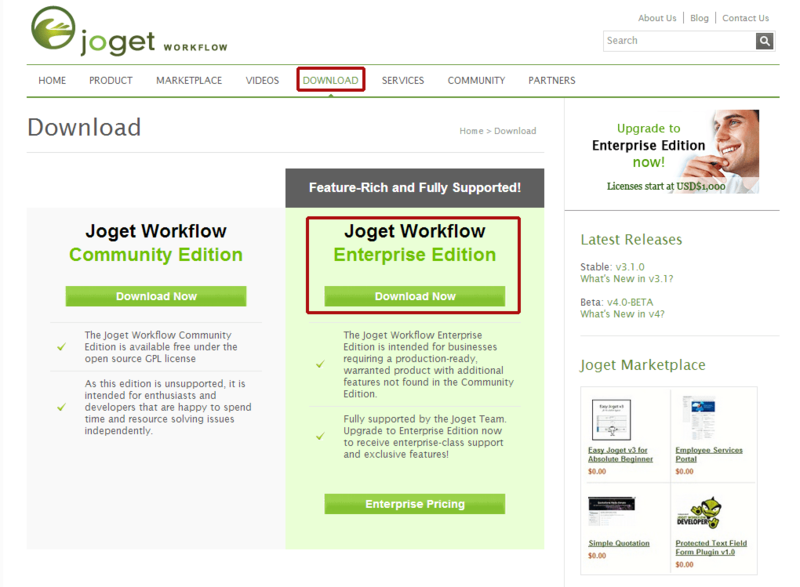 Navigate to joget.org and download the latest Joget Enterprise Edition (bundle for Linux). 3. Upload jw.war and jwdesigner.war (joget-enterprise-linux-x.x.x/apache-tomcat-x.x.x/webapps) to the Jelastic Deployment manager. 4. Deploy these packages to different contexts (e.g. jw and jwdesigner respectively). 1. Open MySQL in a web browser and log in with the credentials Jelastic has sent you earlier. 2. 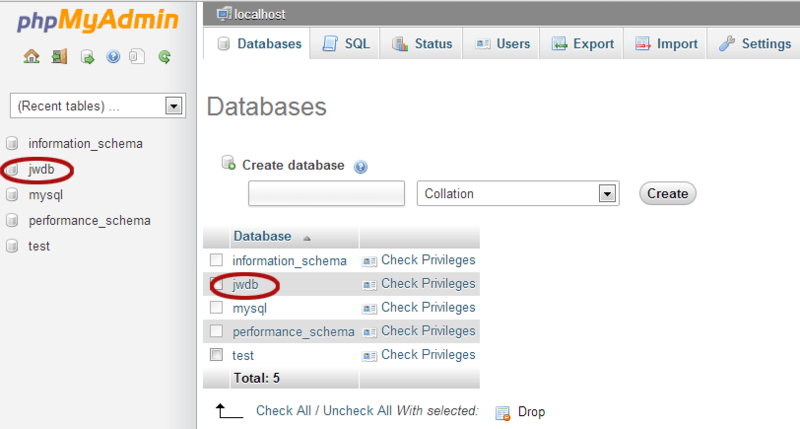 Create a new database for your Joget cluster and name it jwdb. 3. Navigate to query window and import jwdb-empty.sql file (joget-enterprise-linux-x.x.x/data) according to your needs. As you can see all the necessary tables were successfully created. 1. Go back to the Jelastic dashboard and click on the Config button for Tomcat. 3. Save the changes and restart your server. Now your Joget cluster is ready for use. Open the jw context in a web browser and you’ll see the Joget welcome page. You can log in (the default credentials are admin/admin) and start to work with this great application. Jwdesigner context will be helpful for designing the app forms list. 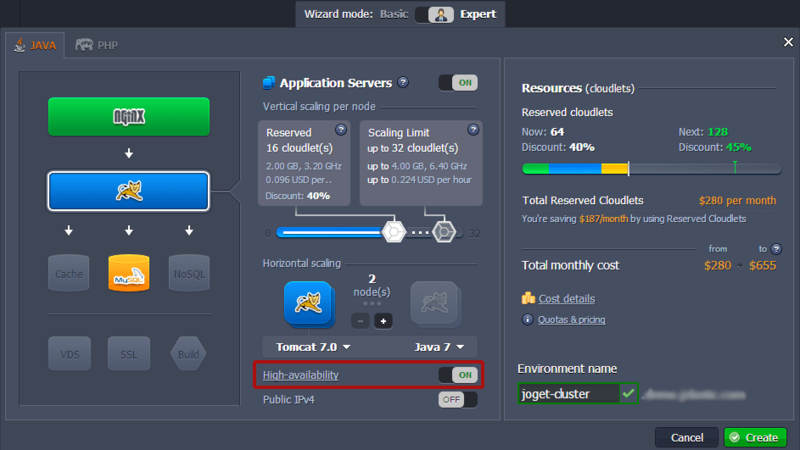 Now you can take all the advantages of using Joget highly available cluster in the cloud! Don’t worry about large scaling, load balancing or failover capabilities – Jelastic will do this instead of you. Enjoy! Don’t have a Jelastic account? Get your free, instant account here.